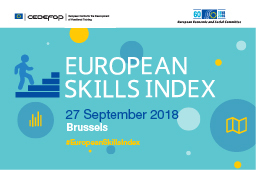 Cedefop released the European skills index (ESI) at a launch event in Brussels on 27 September 2018. Cedefop has been working on compiling a skills index since 2013. Three key dimensions were considered in the development of the European skills index: (a) skills development; (b) skills activation; and (c) skills matching. These three areas capture various aspects of a country’s skills system. In particular, skills development represents the training and education activities that take place in a country, and their immediate outputs in terms of skills developed and/or attained. Skills activation assesses the transition from education to the labour market, while skills matching captures the extent to which skills are effectively used at work and in the labour market in general. Overall, the European skills index measures the comparative performance of EU countries’ individual skills system. The event aimed to introduce the European skills index, as well as present and discuss the results of the 2018 release. Country rankings were presented along with examples of how this tool can be used to explore a country’s skills system and identify areas with improvement prospects. The relationship of a skills system to policy-relevant key employment measures was also discussed. A panel debate looked at the implications of the index results for skills and labour market policies, and discussed how the European skills index could be used as a policy tool. Please find below the related documents: agenda, PPT presentations and our Briefing note.